I just got word that Santa won't be making his usual rounds this year. It seems like his overly rich diet has caused him to get gout. This will unfortunately keep him home on Christmas Eve. 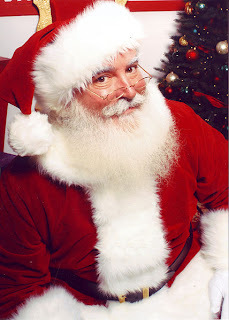 The good news is Santa has contacted teachers around the world to ask for help. He has created a special, super-secret Amazon account that he will use to pay for all the presents this year. All he asks in return is that we have one student per family pick out presents for their entire family. Sounds like fun, right? Your task is to find presents for each person (including yourself) on Amazon and to give that list to me. 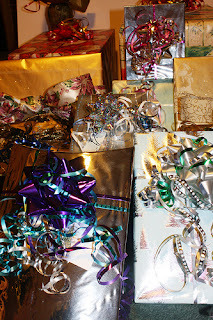 There is one very important qualification, the cost of each person's presents must be between $195 to $200. You cannot spend more or less. Because Santa is a non-profit organization he gets his purchases tax free so we don't have to worry about adding those in. You will need to keep track of the items for each person, the url for each item, and the cost of each item. How you do so is up to you. I would suggest you create a spreadsheet using Microsoft Excel or if you have a Google account you can use Google spreadsheet. Here is a tutorial for creating a spreadsheet in Excel. You could even create a Google form to put in the information you need. Of course paper and pencil will also work. Just make sure the total amount to spend is between $195 and $200. You may want to check with your family members and ask them for ideas, or you could just pick things you think they will want. Santa expects you to explain why you chose the gifts you have for your family and yourself, make sure to include that information with the list.Whichever you choose, get the lists done and give them to me so I can pass them along. You don't want to miss out on Kris Kringle's gifts and if you don't get the lists finished Kris may decide you are not behaving and deal with you appropriately. You will have to download pictures and then upload them to create your movie. Here is the link to the school pictures on Picassa. Just click on the the pictures you want to download. Right click on the picture and save as: name of person to your desktop. Then you will have them to upload. 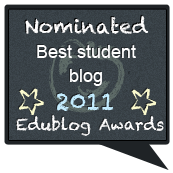 Lakin Has Been Nominated for an Edublog Award! I remember as a child hearing an adult say that watching kids open presents at Christmas was much more fun than opening their own. I thought they were crazy! Of course now that I have kids of my own I completely understand the sentiment. That is why I am so pleased to share Lakin's nomination. Lakin is one of 32 student blogs recognized for their outstanding work. Lakin was nominated by Carolye Foote's blog, Not So Different Future. I am very grateful to her for recognizing Lakin's work. I would be grateful if you took the time to check out the nominees and vote for the one you think is best.